I’m delighted to welcome back Aaron David McIntyre to the blog. He is an undergraduate student at The School of Geography, Archaeology and Palaeoecology, QUB. His research interests include Lisburn in the Gaelic period and the archaeology of the Plantation era. He is also involved in politics with the Alliance Party. Jean Graham’s excavation in the 1950s uncovered flint, pottery and a cist burial, which she interpreted as a Neolithic village. The presence of glazed ware and a pipe stem were explained simply as the remnants of rubbish from recent centuries. This tale was told in the context of increased interest in the study of the prehistoric period which focused on major sites including Lough Gur. Our second tale centres on Humphrey Case who took over the excavations at Goodland, but failed to credit Graham for her work on the site. The 1952-53 excavations revealed twenty six pits surrounded by ditches. These pits contained the remains of broken Neolithic pots, flint and dark earth. The latter is typically associated with domestic occupation. Nevertheless, Case ignored the dark earth, as well as a large quantity of glazed ware, and a 15th/16th century silver brooch, concluding that all the Neolithic objects had been brought to the site from elsewhere. What would have driven the Neolithic occupants of the site to have engaged in such an activity? Case argued that Goodland was part of a Neolithic ritual landscape and the ritual of depositing objects in pits aimed to encourage ‘flint growth’. Prof. Horning stated that while she was all for creative interpretations, she would leave the final judgement of his interpretation to those present. Eimear Nelis reanalysed all lithics from the previous excavations in 2003, which provided evidence for production, use and discarding of flint tools on the site, so not Humphrey Case’s Neolithic ritual landscape after all! The third tale presented by Prof. Horning was that of Estyn E. Evans and his view of Goodland as a ‘most interesting and extensive collection of booley [huts]’. Evans’ viewed the area as a marginal place and through evidence in the OS Memoirs, and the architectural form of the structures, concluded it was a transhumance site. This tale illustrates a different view from that of a fertile Neolithic landscape, highlighting the role of interpretation in understanding archaeology. In 2002 a survey was conducted at the Goodland site. The survey recorded 100 hut sites and other features, half of which were single roomed structures with opposing doors, similar to many known booleying sites in Ireland. The regularity of the huts, with their long axis to the sea suggests some form of regularity and could possibly mean they are all contemporary. Different zones were identified with one or two roomed huts on the cliff, while multi-roomed huts were typically found in the hollow area of the site, and are associated with cultivation ridges, but again their date is uncertain. Perhaps they represent another tale to be told? Also, on inquiring about the medieval and post-medieval material uncovered in previous excavations by Case, Horning could find no trace of the artefacts, which she believes were discarded as they were viewed by previous archaeologists as ‘post-interesting’. Prof. Horning moved on then to her own tale, that of Goodland as a Scottish settlement. She stressed the long standing connection between the north of Ireland and Scotland, especially during the 16th and 17th centuries, and the English concern with this relationship. 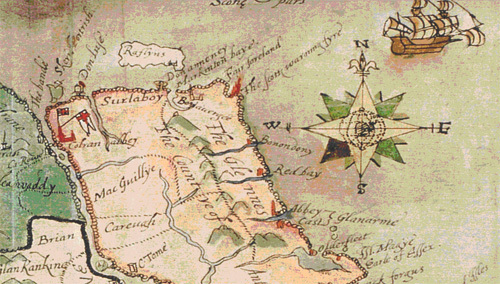 Evidence for Horning’s tale can be elucidated from cartographic evidence including Ralph Lane’s map which states the area was where the Scots lit their warning fires, while Murlough Bay provides landscape evidence, as it is one of a small number of possible landing points. Added to this, there is historically documentation which expresses the English anxieties to the Scottish aiding the Irish during this period. However, she acknowledges the challenge of identifying the settlement as ‘Scottish’ or ‘Irish’ in an archaeological context, due to the shared cultural zone, practices and, at times, language, between the two. Prof. Horning’s tale continues into the 17th century with the role of Randal McDonald in the unofficial Plantation. 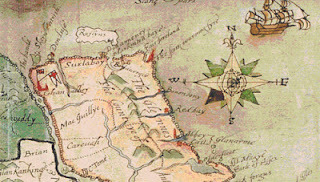 During the 1630s the area of Goodland was regranted to Alexander and Donal Magee under the condition of bringing Roman Catholic tenants from Scotland to their land, establishing a permanent plantation of Catholic Scottish tenants. Horning parallels Goodland with Finlaggan, the centre of the Lordship of the Isles, as the Scottish settlement had similar structures, though these were constructed of stone, rather than earth. Nick Brannon and Audrey Horning had the opportunity to excavate part of a damaged hut, in which they hoped to uncover ‘post-interesting’ material, but discovered a spread of charcoal, pottery and flint instead. With an ‘eye of faith’ and an attachment to her own narrative, Horning saw an Ulster coarse ware fragment as evidence of her story, but in reality the jury was out until a date for the spread was obtained. Upon taking up her position at Queen’s University, one of the first things Prof. Horning did was send a sample for radiocarbon dating. The date came out as late 18th/early 19th century, but she was not convinced. When the site at Goodland is compared with other sites of this period there is a distinct lack of detritus to suggest an 18th century origin. Prof. Horning posed a potential fifth tale for us to consider. Near the site are a number of lime kilns and, she hypothesised, perhaps the charcoal spread was from a lime worker taking shelter and lighting a fire in the remains of a hut, but as before, this is just another tale and further work will need to be carried out in the future for a wider understanding of the site(s) and their chronology at Goodland. Prof. Horning concluded by stating the past exists in the present and the present gazes at the past. Tales told about the excavations reflect, to an extent, what we want to find, and as archaeologists, we look for material to complete our tales. Graham and Case’s conclusion focused on the Neolithic which was itself the centre of archaeological research at that time. Alternately, Evans’ booley theory was treated different as it was view as an ‘authentic’ Irish tradition. Horning’s tale in itself, she admitted, could only be told in a post-Troubles era in Northern Ireland. I wonder what other tales are still to be to uncovered at Goodland? Case, H. J. (1954) ‘The Neolithic Site at Goodland, Co. Antrim’, Ulster Journal of Archaeology, Third Series, Vol. 17, pp.24-30. Case, H.J., Dimbleby, G.W., Mitchell, G.F., Morrison, M.E.S. and Proudfoot, V.B. (1969) ‘Land Use in Goodland Townland, Co. Antrim, from Neolithic Times until Today’, The Journal of the Royal Society of Antiquaries of Ireland, 99(1), pp. 39-53. Horning, A. (2004) ‘Archaeological Explorations of Cultural Identity and Rural Economy in the North of Ireland: Goodland, Co. Antrim’, International Journal of Historical Archaeology, 8(3), pp. 199-215.